Jacek Yerka has won international awards for his art, and has had exhibitions in Warsaw, Dusseldorf, Los Angeles, Paris and London. He works and resides, with his family, in a rural enclave of his native Poland. 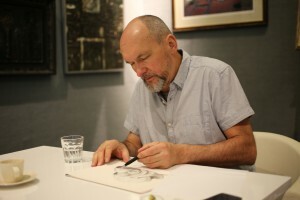 Born in Poland in 1952, Jacek yerka studied fine art and graphics prior to becoming a full-time artist in 1980.While at university, Yerka resisted the constant pressures of his instructors to adopt the less detailed, less realistic techniques that characterize so much of contemporary art. Instead, he stubbornly continued to work in the classic, meticulous Flemish style he still favors to this day.In the end, it was his teachers who eventually relented, finally recognizing their determined student as a brilliant (although troubling) talent. The pastoral atmosphere of the Polish countryside provides a solid, mimetic foundation for much of Yerka’s art. However, it is his own uniquely evocative dreams that limn the complex, often arcane imagery of his work.